Coconut water has increased in popularity among athletes in recent years. From post workout rehydration to a quenching beverage on a warm afternoon, coconut water sales have doubled since 2011. Popular brands such as Vita Coco® and Zico® sell their water through slogans like “Natural OOMPH” and their emphasis on the drinks’ pure and natural nature. It also helps that pop culture magazines blow up celebrities like Kourtney Kardashian buying Vita Coco® at the store. Whatever the reason for this newest craze, there is no doubt that coconut water has something to offer elite athletes if mixed in their daily hydration routine. 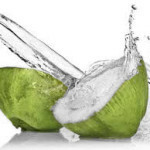 In this post I will take a look at the draws and drawbacks of consuming coconut water in terms of athlete hydration and compare these to typical sports drinks and plain water. 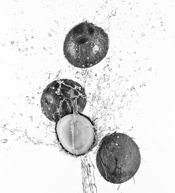 What does coconut water offer? Coconut water is the liquid inside a young green coconut. This is different than coconut milk, which is extracted from the flesh of mature brown coconuts and is rich in fat. Coconut water is naturally fat free, low in calories (45) and rich in potassium (470mg, 13% DRV) per 8 fl oz serving. The two industry dominating brands (Zico® and Vita Coco®) both offer a variety of flavors from pineapple to chocolate. In addition Vita Coco® fortifies their natural coconut water with Vitamin C (100% of your DRV). Recent rehydration studies on coconut water, sports drink and plain water all yielded similar results. One study had subjects perform a bout of dehydrating exercise followed by rehydrating with either coconut water, an electrolyte sports drink or plain water. Conclusions from this study were that all beverages were capable of rehydrating the athlete and none of them were significantly better than the others. Another study compared rehydration with these same beverages (coconut water, sports drink and plain water) but also added sodium-enriched coconut water to the comparison. Results found that rehydration via sodium enriched coconut water was just as effective as a typical sports drink. While a level of rehydration was achieved with each of the beverages, it was found that sodium-enriched coconut water, plain coconut water and sports drink may be better at rehydration than plain water because of the electrolyte content. The last important result of this study to note is that many subjects reported upset stomachs when rehydrating with large amounts sports drinks but did not when consuming coconut water. Coconut water left the subjects feeling less full and might be better for athletes with sensitive stomachs. Draws: Naturally fat free and low calorie. Rich in Potassium. Reports of being easier on the stomach when consuming large amounts. Drawbacks: No sodium content. (Sodium is the main electrolyte that is loss through sweating with the onset of exercise). Expensive. Not everyone enjoys the unique taste. Draws: Replenishes electrolyte levels loss through rigorous exercise. Dozen’s of flavors and brands to meet everyone’s likes. Review my previous post comparing sports drinks to remind yourself the differences and specific benefits and drawback of Gatorade®, Powerade® and Cytomax®. Draw: As stated in Megan’s previous BA blog post on dehydration, water flushes out toxins from the body, aid in cellular repair and is essential for healthy living. For workout under 1 hour in length, water is the ideal fluid. Drawback: If you are looking for replenish your electrolyte levels post-exercise, water will not provide that. However consuming water in addition to an electrolyte-fortified drink is very important. Water is essential to life and the importance of consumption cannot be stressed enough. Hydration is extremely important to performance, and as summer approaches it is even more crucial to take a look at your hydration habits. Coconut water, sports drink and plain water are all capable of hydrating the body, however just like with any nutrition regimen it is important to find what combination is right for you. Finding the right balance of fluid intake is a simple way to promote health, recovery and performance. As the weather warms up, try something new and grab a coconut water to rehydrate and replenish lost potassium levels-it may be just what you need to keep hydrated and performance ready.